stock photo because I was so hungry I forgot my camera!! I found a recipe for grilled fish tacos here and I couldn’t wait to make these for a dinner al fresco one night this summer. Unlike most fish tacos that are battered, fried and salted, these fish tacos are grilled, lightly seasoned and very healthy. We served these with a corn and tomato salad and margaritas (decidedly not healthy, but a great complement to the meal). For those of you like me who HATE cilantro, you can omit it from the recipe. However, I included a little bit because D loves it and I couldn’t taste it in the final product. I have no idea why, but I only took a picture of the fish pre-cooking so there’s no “finished” product photo to share here. D remembers that I was so hungry when I made these that I refused to let him take any pictures before diving in. Lesson learned for next time around! 1. Stir 1/2 chopped onion, 1/2 of the cilantro, lime juice, garlic and oregano in a medium bowl. Spread half of the mixture over bottom of a glass baking dish. 3. Arrange fish atop onion mixture and spoon remaining mixture over fish. 4. Cover and chill for at least 1 hour (flip fish halfway through so both sides marinate evenly). 5. Using a grill pan or a grill, brush lightly with oil and turn heat to medium-high. 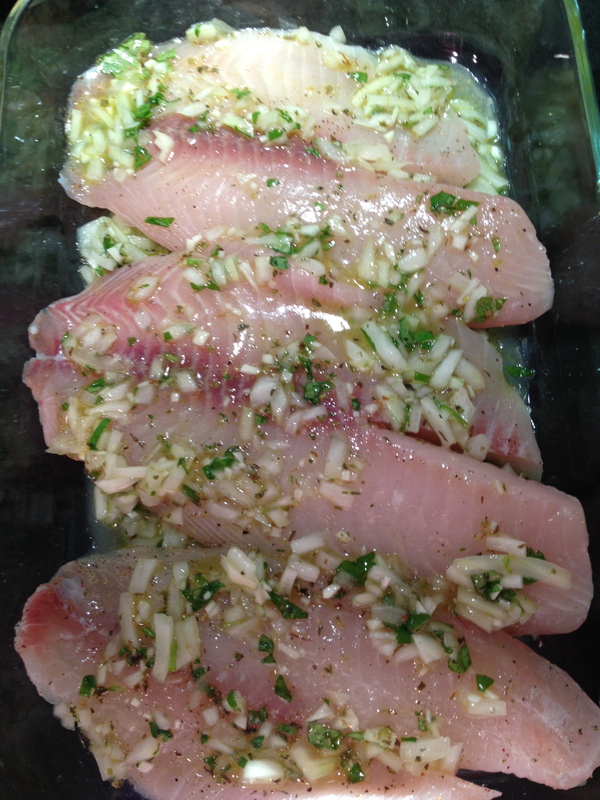 Grill fish with some marinade still clinging to it until just opaque in center, 3 to 5 minutes per side. 6. Coarsely chop fish and place on platter. 7. Grill tortillas (about 10 seconds per side) or warm them in the over (5 minutes at 300 degrees). 8. 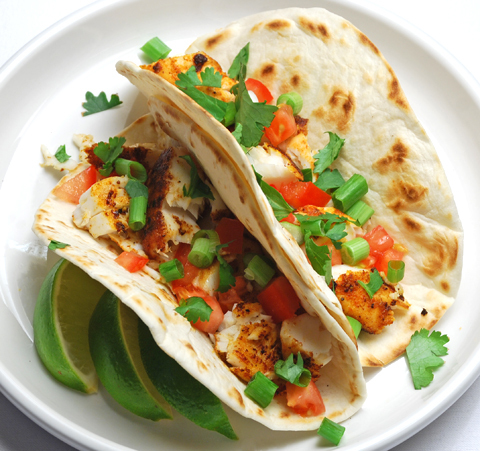 Serve fish with warm tortillas, remaining onion and cilantro, along with avocado, lime wedges, cheese, cabbage, tomatoes, jalapenos and any other garnishes you have in your kitchen!